What do you guys think of Promise Butter Spread? As you may remember, I've included it as an ingredient in a handful of previous recipe postings on Yummy Diet Food (see the end of this posting for a quick list). 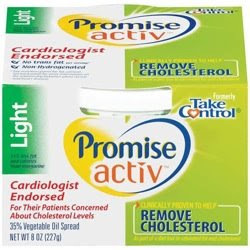 The nice thing about Promise Activ Spread Light (the kind I have at home) is that it is a really tasty low calorie and low fat butter substitute that does not contain trans fats like margarine. Instead, it is made of vegetable oil, milk protein (whey), and plant sterols (believed to help lower cholesterol). Promise Activ Spread Light also has going for it that it works effectively in recipes as a butter substitute, in addition to also being really good for just adding butter to a potato or to your toast. In the calorie department, one tablespoon is 45 calories and 5 grams of fat (1 gram of saturated fat), so it's a little less than half the calories of real butter. Each serving is also high in Vitamin D, Vitamin A, Vitamin B6, Vitamin E, and Vitamin B12. On the flip side, Promise Spread, despite being low calorie, is not as natural as butter. So, I could see some people arguing that butter is a healthier option, and I sometimes even ponder that myself. At the same time, I wanted to make you aware of Promise in case it was something you didn't know about that you would want to try. I'm personally glad I found it, and I enjoy using it in recipes every once in a while. As promised, here is a quick list of the recipes I've posted that included promise spread in the ingredients: (1) low calorie fettuccine alfredo, (2) low calorie banana bread, (3) low calorie mashed potatoes, and (4) low calorie bananas foster. What do you think of Promise Spread? Ever had it? Love it or hate it? I use "I Can't Believe It's Not Butter" and that's 80 calories. I'll have to try Promise. Thanks for the tip! I use Smart Balance Light or Whipped Earth Balance when cooking--each has a lot fewer calories/fat than butter, plus zero cholesterol, and are non-hydrogenated and trans fat free--and the Whipped EB is organic! I may be "the Diva on a Diet" but I have to admit I use real butter, not spreads or butter substitutes. I just prefer the real stuff and I cut back by using less of it. My husband, though, has cholesterol issues and no longer eats butter. I buy the Brummel and Brown spread for him and he really likes it. I'll have to try this! I'm glad it can be used as a substitute in low-fat dishes. I love Organic Valley Light Whipped Butter. It's 50 cals per tablespoon and has two ingredients: Sweet cream and salt. It rocks for taste, and the nutrition is quite good for butter. I got scared off of ICBINB, but I'm curious about Promise. I just want to start off and say I'm a huge fan. You've really helped me put the fun back into eating. I've been doing some searching around myself, and I found that Promise has a fat free version that's only 5 calories a tablespoon! The world deserves to know.